If evolution was studied from a scientific perspective, it could be easily falsified. However, evolution has become immune to falsification in the minds of most biologists. This is evident by studying the logic they employ. Because everyone agrees that a theory must be falsifiable to qualify as science, evolutionists frequently publish specific challenges for falsification, while categorically excluding all other possibilities. In reality, the hypothetical "disproofs" commonly believed to be capable of overthrowing evolution are primarily philosophical disproofs. Many proposed challenges to the falsification of evolution merely represent the imagining of how reality would be if God existed. No challenge to refute evolution on purely scientific grounds is given. In Origin of Species, Charles Darwin stated that the theory of evolution could be falsified if an impossibility to gradualism were found in nature. * Many examples have been offered that fulfill this challenge. Since 1859, evolutionary theorists have changed Darwin's proposal of falsification by a limited selection of certain criteria that they believe would disprove evolution. An oft repeated challenge first proposed by Dr. J.B.S. Haldane in the 1950's is the challenge of finding of a rabbit fossil in precambrian rocks. 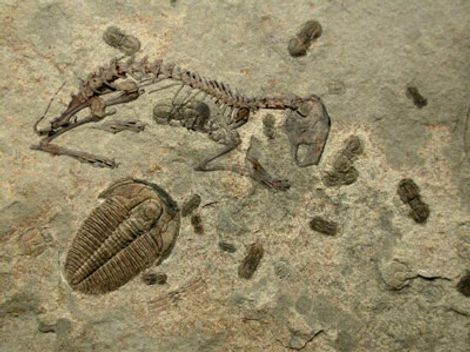 Since modern mammals are stated to have evolved hundreds of millions of years later than the precambrian period, the finding of a rabbit in that time period is commonly stated to be capable of overthrowing the theory of evolution. Such a challenge is ridiculous in view of the fact that all fossils in "precambrian" strata are marine fossils. Thus, the finding of a rabbit fossil admixed with marine fossils is absurd regardless of one's theory as to when the strata were laid down. The evolutionist simply assumes that when precambrian organisms lived, no mammals existed. It is imagined that the lack of mammals admixed with marine fossils somehow validates the contention that marine life pre-dated mammals. Numerous inconsistencies have been documented in the concept of the geologic column. These facts are in no way considered as evidence against evolution. For example, pollen grain has been found in Precambrian rock that is ‘dated’ hundreds of millions of years before pollen-producing plants were supposed to have evolved. Another example is the discovery of partially fossilized dinosaur bones purported to be 140 million years of age or more. Some of these remains have been found which contain residual soft tissue including collagen and blood vessels. The persistence of these elements within fossilized bone is inconsistent with ages of millions of years. Radiocarbon dating of some specimens has invalidated the commonly stated millions-of-years ages of such fossils. Dr. Douglas Theobald suggests that if animals were intelligently designed, feathers would exist in mammalian species such as bats and lactation would occasionally be seen in birds. This proposal is founded solely on a religious concept of an intelligent creator. Dr. Theobald claims that if feathers occurred in mammals, the entire theory of evolution would collapse. This conclusion is based on the fact that a feather is too complex to evolve twice in two unrelated species. However, Dr. Theobald and many other evolutionists readily accept other complexities as having evolved independently in divergent species. An eye is far more complex than a feather. Nevertheless, Dr. Theobald has no problem accepting the appearance of nearly identical complex camera eyes in a human as well as marine cephalopods. However, he imagines that if a feather occurred in a mammal he would be convinced of the fallacy of evolution. 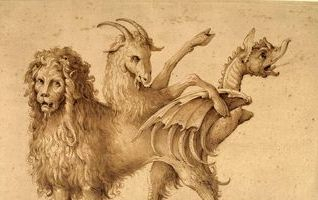 In a bizarre twist of logic, evolutionists sometimes insist that non-existent animals such as a griffin, centaur or mermaid provides evidence for evolution. 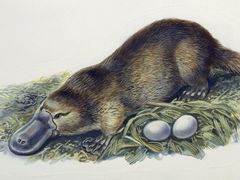 The duck-billed platypus has several features of different lineages, similar to a true chimera. When a mounted specimen was unveiled in England in 1799, biologists believed it was a hoax, fabricated by a skilled taxidermist. Dr. Theobald believes that if a chimera* such as a mermaid were found that evolution would be disproven. Many proponents of evolution have utilized this same argument. Yet the existence of monotremes such as the platypus presents an equally mysterious obstacle to evolution. In short, evolutionists imagine nonexistent conditions that could falsify evolution, and conclude that their absence validates their claims. These challenges to falsification are made in the face of equally challenging anomalies in nature that are readily accepted as consistent with evolution. All of the challenges to falsification proposed by evolutionists rely on observations in nature that are assumed to be inconsistent with evolution. These include contradictions in the geologic column such as finding a rabbit in Precambrian rock, proof of a young earth through radiometric dating, and the existence of chimeras such as centaurs and mermaids. It is assumed that all proposed pathways of evolution are scientifically valid. It is assumed that the uniform genetic code of all living things is powerful evidence of evolution, and that the finding of a different genetic code in an isolated species would falsify evolution. This is not a challenge to falsification. It is a philosophical argument that God would not confine creation to one genetic code. It is believed that if apes and humans had very dissimilar DNA, evolution would be disproven. This is another philosophical argument. Proponents of evolution demand that something scientifically illogical be found to disprove evolution. This is because they assume that an intelligent creator would defy all laws of science and would conduct the creative process in a scientifically illogical way. The provision of such a carefully selected list of challenges to falsify evolution is of interest. Such a limited and unrealistic scope of hypothetical inconsistencies with evolution is indicative of the carte blanche acceptance of the enormous obstacles that logically prevent evolutionary transmutation. It is a quasi declaration that evolution cannot be falsified. Apparently, the non-existence of mermaids, feathers in bats, and rabbit fossils in the pre-cambrian rocks is deemed as evidence that God did not create the world. It is significant that in all challenges to the falsification of evolution, no observation based on complexity is considered inconsistent with evolution. No complexity is deemed impossible for evolution to create, because inconceivable complexities already exist that have been credited to evolution. Any morphological continuum, regardless of man's inability to conceive of functional intermediates, is concluded to be plausible. The assertion of non-functional intermediates is immediately rejected as being capable of falsifying evolution. This represents a concession that plausible functional intermediates are not found. If functional continuities were evident in all proposed evolutionary pathways, Darwin's challenge to find conceptual impossibilities to gradualism would continue to be considered viable. Today, biologists such as Richard Dawkins ridicule skeptics because of their lack of imagination or credulity in accepting conceptually impossible intermediate forms. No probability challenges are considered as evidence of falsification. This position has been taken because all probability challenges to evolution are insurmountable and can only be rebutted by utilizing false concepts of probability. In the evolutionary paradigm, no true scientific challenges to falsify evolution are considered. Scientific falsification of a theory is not the imagining of non-existing aspects of nature that would have falsified evolution, and then supposing that such observations provide evidence of evolution. Feathers do not occur in bats. It is retrospectively imagined that if bats had feathers, no one would consider evolution possible. The exclusion of true scientific challenges to evolution is indicative of the corruption of science that pervades the establishment of evolutionary biologists. It also provides insights into the fact that biologists have consigned themselves to simply accept scientific impossibilities on faith rather than confront logical challenges to a theory. Perhaps the greatest breech of scientific logic employed by proponents of evolution is the practice of accepting conceptual impossibilities without plausible explanations. Because so many apparent impossibilities exist in nature in terms of gradualism, it has become a popular belief that those who question evolution should squelch their curiosity for answers and accept evolution on faith. In the evolution debate, a common rebuttal presented by evolutionists is the so-called argument from incredulity. In this accusation, the evolutionist ridicules skeptics for insisting that a proposed evolutionary mechanism is impossible because it is implausible. Sometimes the skeptic is accused of intellectual laziness because he gives up searching for naturalistic explanations. He is chastised for merely assuming the existence of intelligent design by default. This pattern of logic was popularized by Richard Dawkins and is a commonly used retort to challenges of the evolution of complexity. It is contended by many who promote Darwinism that it is illogical to conclude that any complexity was created through intelligent design. Skeptics are expected to never give up searching for naturalistic explanations, regardless of how inconceivable such an evolutionary pathway might be. Such a position broadly dismisses all possibilities of falsification by fixing a pre-drawn conclusion that a naturalistic explanation exists. "Anyone can state at any time that they cannot imagine how evolutionary mechanisms might have produced a certain species, organ, structure. Such statements, obviously, are personal – and they say more about the limitations of those who make them than they do about the limitations of Darwinian mechanisms"
Underlying this logic is the presumption that a naturalistic explanation exists when the entire theory rests on metaphysical presuppositions. When a theory is in question, one cannot appeal to the validity of that theory in any way to counter a challenge. Frequently, the accusation of personal incredulity is used. In this, it is implied that those who question evolution have a personal hang-up with a given explanation, which should be obvious to anyone with a scientific mind. In making this accusation, invariably no plausible explanations are offered. For example, in the proposed origin of the feather, the skeptic of evolution points out that there is no plausible explanation how so many specific improbable mutations could have occurred to result in something that is so perfectly adapted to flight, before the animal achieved the ability to fly. The rebuttal is that a lack of understanding doesn't mean that it didn't happen, and the creationist is belittled for not believing in something that cannot be defended by logical scientific explanations. In the case of the proposed evolution of the feather, he is expected to accept evolution as a fact without being offered even a hypothetical model as to how such complexities could have evolved. In addition, no actual evidence that a feather did evolve is presented. When asked about the proposed evolution of the feather, prominent evolutionary biologist Dr. Richard Dawkins responded, "There's got to be a series of advantages all the way to the feather. If you can't think of one, then it's your problem, not natural selection's problem..."
In this commentary, Dawkins assumes evolution to be factual and dismisses lack of evidence as irrelevant. Valid skepticism is not just left unanswered. It is ridiculed out of a lack of faith in natural selection. It is not a virtue to assume that a given dogma is valid. It is a weakness. A fundamental tenet of science is skepticism. No conclusion should be accepted without objective proof. A scientist should not persist in believing something when logical explanations fail. The commonly employed "argument from incredulity" rebuttal is indicative that evolutionists defend their dogmas from a religious perspective. They ridicule skeptics for their lack of belief. On the popular pro-evolution website talkorigins.org, a comprehensive list of creationist arguments is presented, and a response to each argument is given by Ph.D-level intellectuals. In many of the arguments such as problems of irreducible complexity, evolution of beauty and abiogenesis, the primary response to the challenge given is the one-size-fits-all argument from incredulity. In arguments of origins, it is often assumed that evolution is a fact and therefore all perceived inconsistencies in the theory do not represent falsification, but, rather, a lack of knowledge, imagination or credulity on the part of the skeptic. The consensus of so many biologists that evolution does not need to be scientifically validated has rendered the theory non-falsifiable.